My husband called me this morning at work, and when he starts the conversation with "I don't want to tell you this at work but you need to know" is never good. 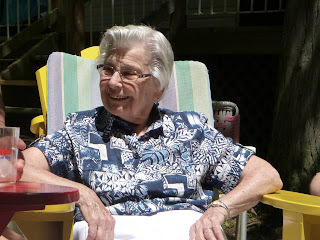 My sweet, quiet, kind Grandma Leakey passed away suddenly. That is three grandparents since the end of January. The other two were expected, they had been ill and you could see them going downhill. This one - she drove herself to the cottage on the weekend and spent the day with us - has taken us all by surprise. Still no details, my Dad promised to call when he knew more....I'm home now, sitting here in shock. RIP Grandma Hazel, may you find peace in Grandpa's arms as he was waiting for you - I'm sure of it. So sorry for your losses. I hope it stops here. I lost two grandparents within about 6 weeks, many years ago, so have some idea of how devastating it can be. Oh Rebecca, my heart is so sore for you and your family. I am sending many hugs to you and your family. Take care.